Discussion in 'Projects' started by Kayas, Feb 11, 2019. So this collab has been overstaying it's welcome due to the business that Yegor has been going through. Therefore fellow team member and moderator, @Shulkle and I are hosting this collab (this will be the final thread, I swear). We are seeing to the collab's end. With introductions out of the way - let's get on it. - You can add any kind of mob, but make sure that the sandbag summons them. - You are allowed to make the sandbag attack back using Sai’s powers (AKA the claws or any other effect but make sure it’s hued in purple). - Stay inside the map, that includes the castle in the background and under the water (that is saved for the finisher with a certain story). You can still animate the fight on water or on the grass patch in the background, just don’t go outside of the map. Fight the sandbag and the mobs it produces. Either you lose by flying off the stage (or some other reason) or you send it flying and defeat it somehow. Resources will be provided in the Discord once you get accepted. Initial due date is 2nd June 2019. You can do it here, in the Discord or DM it to me on Discord if you have me added. Shulkle and I will respond to you as soon as possible. Thanks for taking the time to read this! SuperKimxD , BulbaWhat98, quentin galloway and 1 other person like this. I call shotgun on Knuckles. @Miles @Shinn You got it! But didn't you have a box showing what the weapons actually looked like last time? I think it'd help us choose the weapons if we could see them first. Plus what's the min and max length our parts can be? You're in. Join the Discord link at the bottom of the thread. you still need a bit more room to grow. gonna be a no from me, but i'm glad you have it a shot! i'm going to have to say no to this. it just isn't enough length wise and is lacking in fundamentals. If I made an animation that has a longer length would that be better?? I still think your skill level is below what we're looking for in this collab personally, but if your animation shows this level of understanding better, yeah sure. Kayas and Smeagal like this. 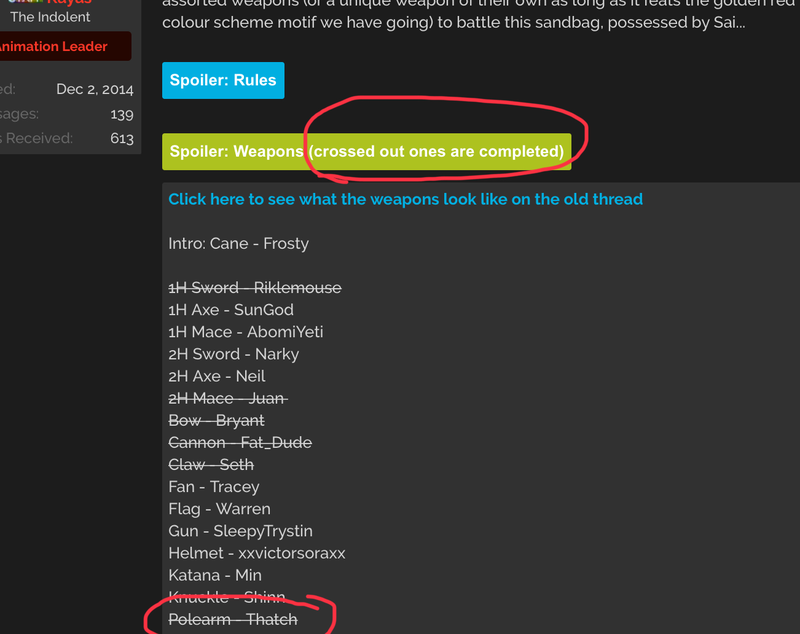 Bear in mind, you are all still able to apply with unique weapons (as long as it's coloured in the gold-red style the other weapons are like) - however, I am upping the skill floor by a minimal amount because the default weapons are filled out. tbh kinda wish kinda wish i knew this earlier, but whatever i guess. It was in the thread already at the end of the second paragraph.